As the Global Economy grows ever more competitive, people are looking for ways to stand out above the crowd. For many, a Masters in Business Administration (MBA) is an increasingly attractive option. 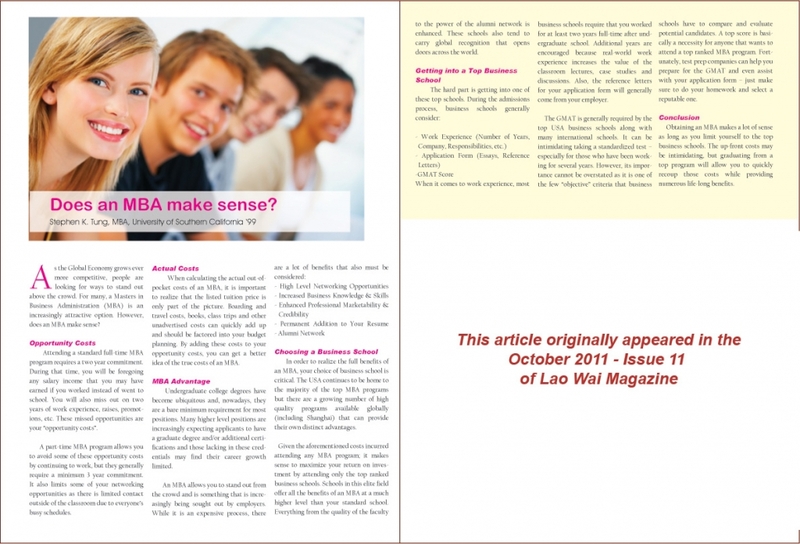 However, does an MBA make sense? Attending a standard full-time MBA program requires a two year commitment. During that time, you will be foregoing any salary income that you may have earned if you worked instead of went to school. You will also miss out on two years of work experience, raises, promotions, etc. These missed opportunities are your “opportunity costs”. A part-time MBA program allows you to avoid some of these opportunity costs by continuing to work, but they generally require a minimum 3 year commitment. It also limits some of your networking opportunities as there is limited contact outside of the classroom due to everyone’s busy schedules. When calculating the actual out-of-pocket costs of an MBA, it is important to realize that the listed tuition price is only part of the picture. Boarding and travel costs, books, class trips and other unadvertised costs can quickly add up and should be factored into your budget planning. By adding these costs to your opportunity costs, you can get a better idea of the true costs of an MBA. Undergraduate college degrees have become ubiquitous and, nowadays, they are a bare minimum requirement for most positions. Many higher level positions are increasingly expecting applicants to have a graduate degree and/or additional certifications and those lacking in these credentials may find their career growth limited. In order to realize the full benefits of an MBA, your choice of business school is critical. The USA continues to be home to the majority of the top MBA programs but there are a growing number of high quality programs available globally (including Shanghai) that can provide their own distinct advantages. Given the aforementioned costs incurred attending any MBA program; it makes sense to maximize your return on investment by attending only the top ranked business schools. Schools in this elite field offer all the benefits of an MBA at a much higher level than your standard school. Everything from the quality of the faculty to the power of the alumni network is enhanced. These schools also tend to carry global recognition that opens doors across the world. When it comes to work experience, most business schools require that you worked for at least two years full-time after undergraduate school. Additional years are encouraged because real-world work experience increases the value of the classroom lectures, case studies and discussions. Also, the reference letters for your application form will generally come from your employer. The GMAT is generally required by the top USA business schools along with many international schools. It can be intimidating taking a standardized test – especially for those who have been working for several years. However, its importance cannot be overstated as it is one of the few “objective” criteria that business schools have to compare and evaluate potential candidates. A top score is basically a necessity for anyone that wants to attend a top ranked MBA program. Fortunately, test prep companies can help you prepare for the GMAT and even assist with your application form – just make sure to do your homework and select a reputable one. Obtaining an MBA makes a lot of sense as long as you limit yourself to the top business schools. The up-front costs may be intimidating, but graduating from a top program will allow you to quickly recoup those costs while providing numerous life-long benefits.